Most people have some type of “trigger food” – that one food that they can’t keep in the house, for fear of overeating. For me, that was dessert. When I finally made peace with food and gave myself unconditional permission to eat all foods a funny thing happened. 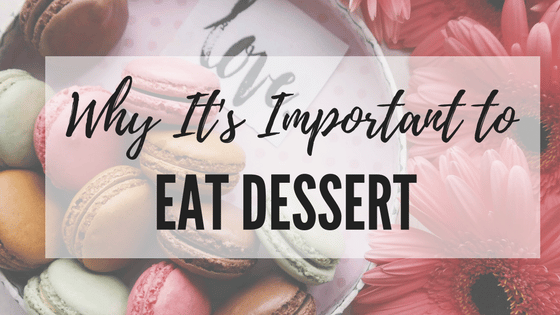 Read on for my epiphany along with four reasons why you should eat dessert. Throughout my late teens and into my 20’s, I had a strict rule: desserts or sweets could only be eaten a certain number of times per week. At the time I thought I was doing something good for my body (and my weight), but as it turned out, the opposite was true. The idea of putting limits on sweets or desserts comes from the belief that there are “good” foods and “bad” foods. These labels place a judgment on food, and therefore on ourselves when we eat them. If we eat cake, we’ve been “bad”, but if we have a salad for lunch we were “good”. I used to think that I had no willpower when it came to chocolate (I also hear this exact same phrase from almost every person I meet – just swap out chocolate for their “trigger” food). I couldn’t keep it in my house or else I would eat it all. Hence the “dessert x times per week” rule. I thought that, since my willpower sucked, I needed an external rule to keep me from binging on sweets. As it turns out, these external rules were actually the reason why I ended up going crazy with sweets or dessert whenever it was around. I was stuck in the “good food” and “bad food” mentality which led to cycles of guilt, restriction, and the inevitable binge when I finally “gave in” and ate sweets. 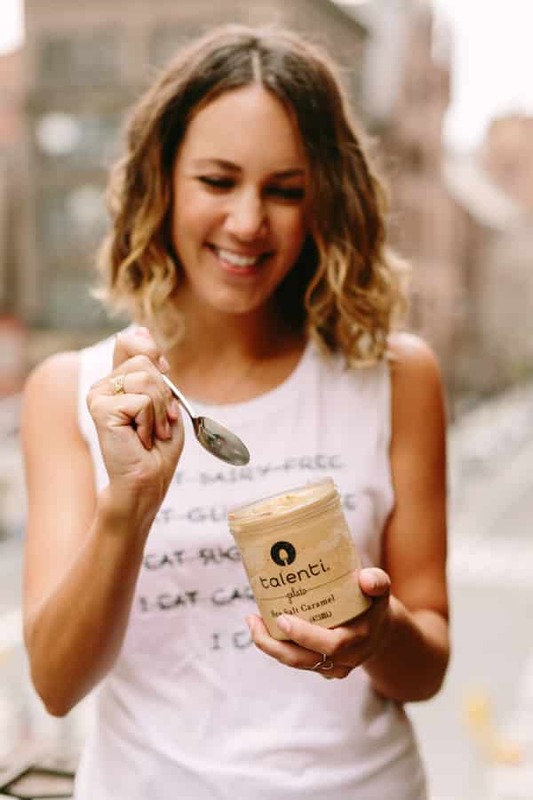 When I finally made peace with food and gave myself unconditional permission to eat all the foods (including dessert) a funny thing happened – I found that I rarely craved or wanted sweets. Here’s why allowing yourself to eat dessert is an important step in the intuitive eating process. 1. You’ll stop obsessing about sweets. Restricting a food or labeling it as off-limits, in order to try to eat less, almost always has the opposite effect. Tell yourself you won’t have dessert for a week and then the only thing you can think about is, well, dessert! If you’re always trying to hold out and not eat dessert, you’ll end up thinking about dessert nonstop. That’s a whole lot of mental energy to spend thinking about food. Free up your mind and use that energy elsewhere! 2. You’ll cut down on the dessert binging. Many of my clients tell me that they’re so “good” at avoiding dessert during the week, but on the weekends, or late at night, they end up overdoing it and binging on candy, sweets and snacks. Restriction breeds binging – it’s not sustainable to think that you can never have dessert. Building any kind of eating plan around something that is impossible to do long-term is always going to set you up for failure. 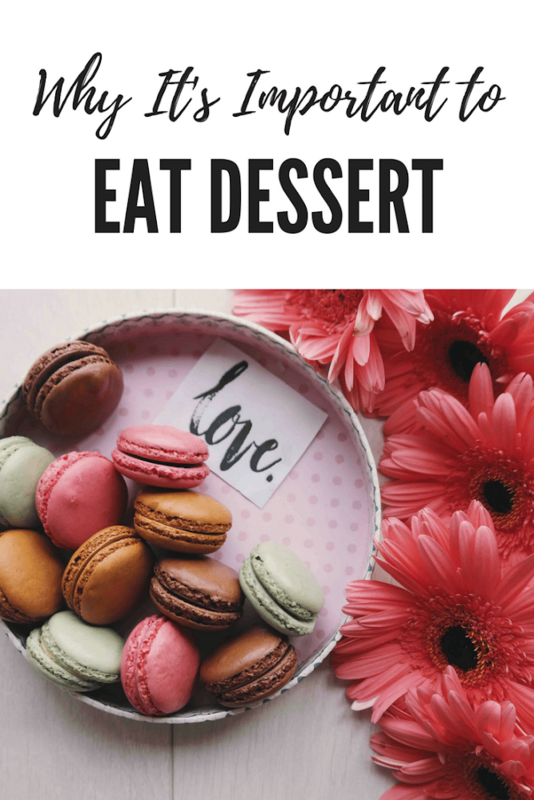 Instead, by allowing yourself to have dessert whenever you like, you allow for a more flexible way of eating that is better for both your health and your sanity. 3. You’ll be satisfied with less. When I stopped limiting the number of times I could eat dessert I suddenly found that I was satisfied with less. No longer did I need to eat cookie after cookie, feeling like it was the only chance I’d get to eat sweets that week. Once I allowed myself to have dessert whenever I felt like it, I no longer felt the need to keep eating and eating; I knew I could have more the next day. I was able to get back in touch with my body’s feelings of hunger, fullness and satisfaction and realized that more often than not, I’m satisfied with less dessert. Gone are the days where I felt like I needed sweets every night after dinner. Now that I’m tapped into what my body really wants, and know that I can eat dessert whenever I feel like it, I’ve found that I don’t need chocolate as much as I thought. 4. You’ll ditch the guilt and self-loathing. Restricting breeds guilt. When you do eat sweets or treats, you likely end up feeling bad about it, which can lead to overeating or overdoing it. This isn’t just mental – guilt can cause your body to release stress hormones, which cause a rise in appetite, so you actually feel hungrier. When I used to limit myself to sweets once a week, I always go totally overboard and eat all kinds of sweets because I felt like I “deserved” it. Afterward, I’d be left feeling guilty and out of control. This guilt leads to further stress and food restriction (trying to make up for having a “bad” day) or excessive exercise, which just starts the cycle of guilt, restricting, and overeating all over again. Eating food does not and should not be associated with guilt or shame. When you allow yourself to eat dessert whenever you want, you can enjoy every bite mindfully and without the self-loathing. Bottom line: if you want the ice cream, eat the ice cream (the real stuff!). Are you interested in learning more about ditching the scale? I work with clients virtually throughout the US, helping people who are frustrated with dieting change their relationship with food and say goodbye to diets once and for all. Learn more about my intuitive eating nutrition coaching programs to see how you can find balance and develop long-term lifestyle habits, no diets required. I love this post and totally had similar experiences with some of my fear foods. Intuitive eating literally changed my life and it is so wonderful to have dessert every night and feel great about it 🙂 Freeing that space up in my mind is the most wonderful gift from intuitive eating!! That’s wonderful you’ve had this experience – freeing up more brain space is such a great feeling!